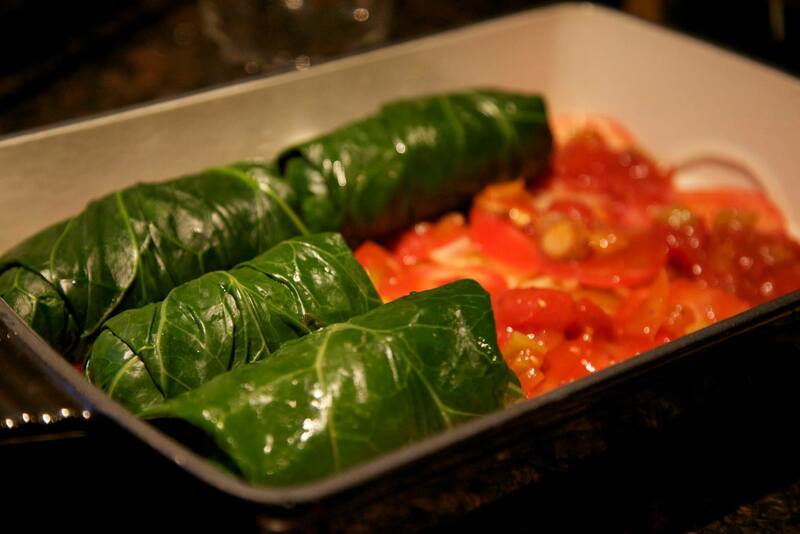 Roll into the New Year with a healthy twist on the traditional cabbage roll! Let the economical collard green shine in the limelight as it’s typically downplayed by its similar leaf, kale. Although kale bodes more popular, collards are nutritionally up to par. Both greens are exceptionally rich in vitamins A, C, and K, along with beta-carotene, iron, calcium, and potassium. 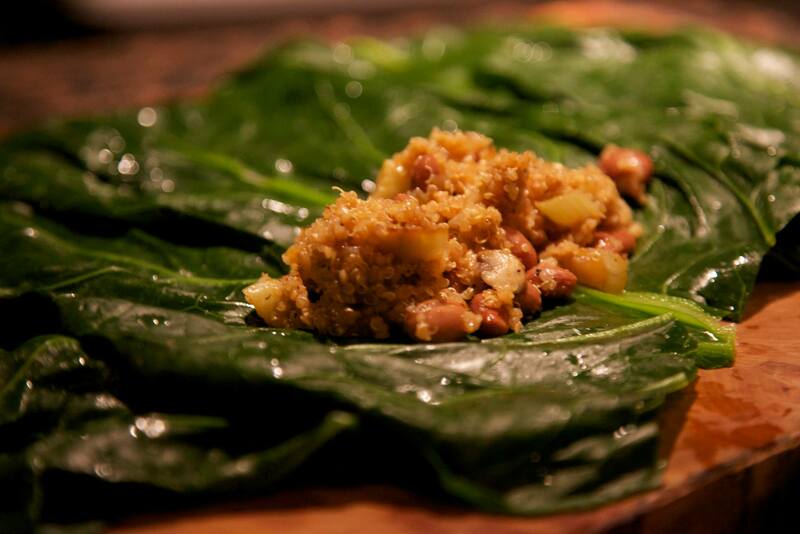 Collards are infamous in the Southern United States and are typically served with a salted or preserved meat. 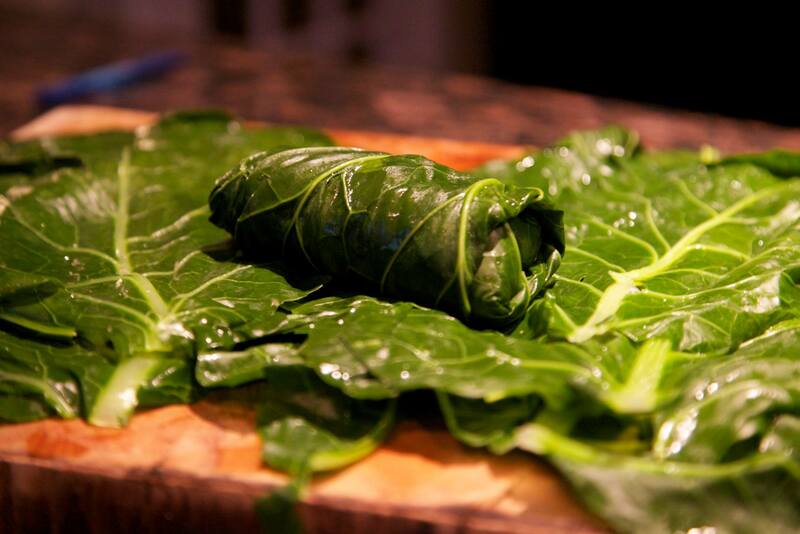 However, these stuffed collard leaves are full of protein and flavor sans the meat. Quinoa is the perfect grain to use because it’s a complete protein (unlike most grains) and adds a nice, fluffy texture. Begin by cooking the quinoa, typically 1 1/2 cups water to 1 cup quinoa. Boil the water, add quinoa and simmer until quinoa fluffs about 10 minutes. Heat a large non-stick skillet over medium-high heat. Add olive oil then add the onion and a generous pinch of salt, saute, stirring regularly, until it begins to brown. Next, add the Hungarian pepper and celery and cook, adding a little water if it starts to dry out, until the vegetables are tender. Add the mushrooms and the garlic and cook for another minute. 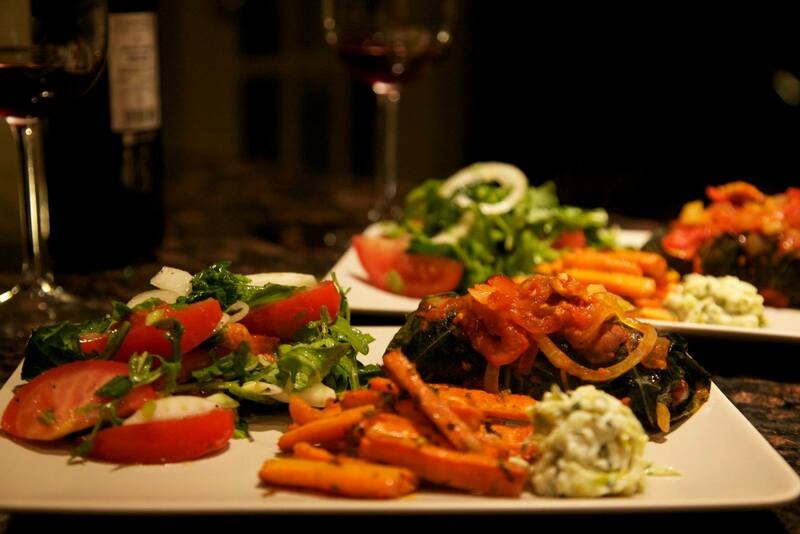 While the vegetables are cooking put the fire roasted tomatoes into a small mixing bowl. When the vegetables are done remove 3/4 cup of the vegetables from the skillet and add them to the fire-roasted tomatoes with salt and pepper to taste. Set aside. Now add the cooked quinoa to the skillet, along with the beans including 1/4 of the bean-liquid and the seasonings. Bring to a low simmer and cook for about 5 minutes, stirring regularly and adding additional liquid if it starts to dry out. Remove from heat. In the meantime prepare the collard greens, bring a large pot of water to boil. Wash the collard leaves and cut off the stems level with the bottom of the leaves. The secret to perfect cabbage/collard rolls is to trim the tough, central stem, so turn the leaves with the coarse side up, and holding a very sharp knife parallel to the leaf, trim off part of the thickened central rib. In two batches of 5, place the collard leaves into the boiling water, gently submerge them and boil for 3 minutes. Remove with a slotted spoon and rinse in cool water. Repeat with remaining leaves. Prepare a casserole dish with olive oil and layer the thinly sliced onion and tomato to the bottom of the pan. Then, spoon half of the fiery roasted tomato mixture on top. 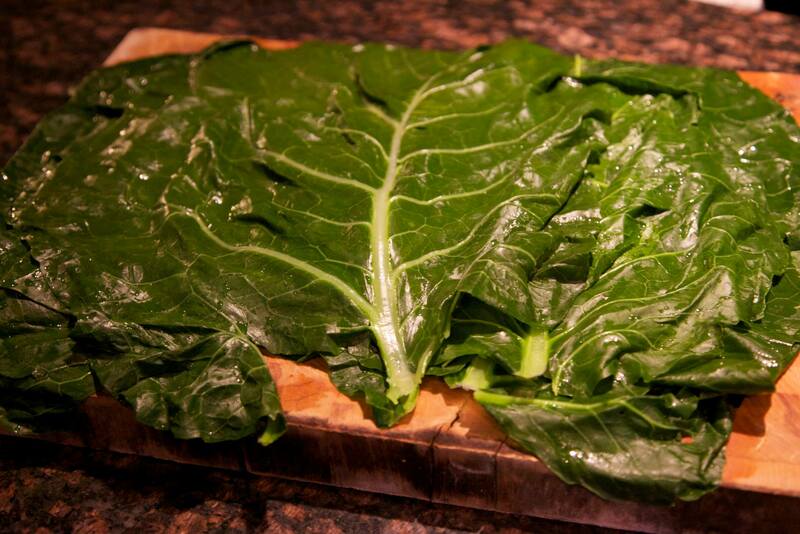 Have your cooked collard greens ready, lay them out trimmed side up and stem closest to you on a flat surface. 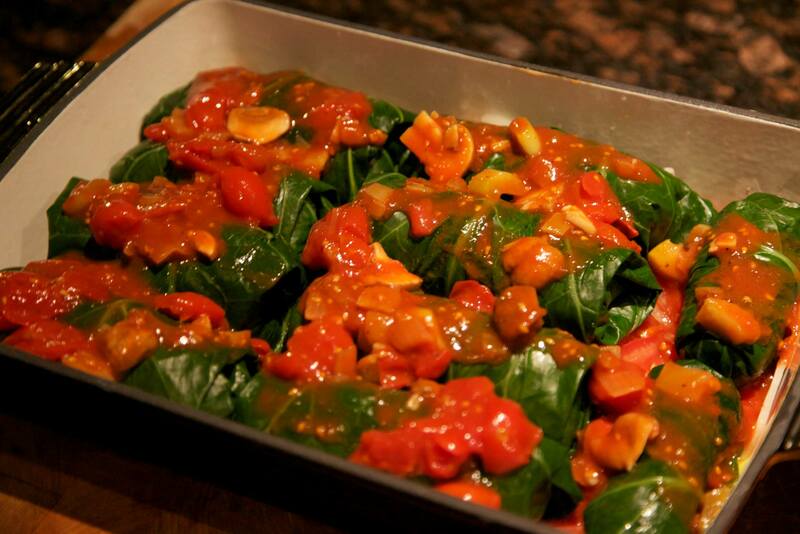 Posted on December 4, 2013 October 31, 2017 by Table Without BordersPosted in RecipesTagged Cabbage Rolls, Collard Greens, Fire Roasted Tomatoes, michelle swift, Quinoa, Stuffed Collard Greens.